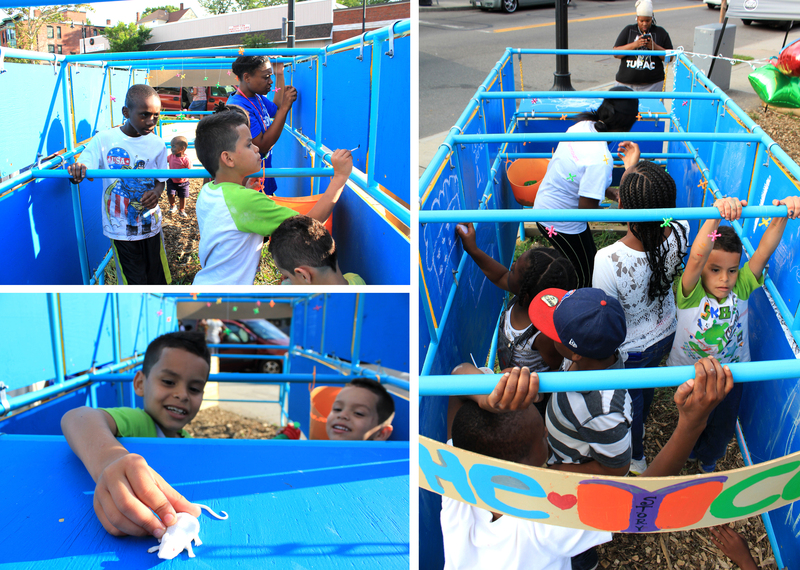 The Big 4Corners Community Communication Toy serves as infrastructure for community information and asset sharing. 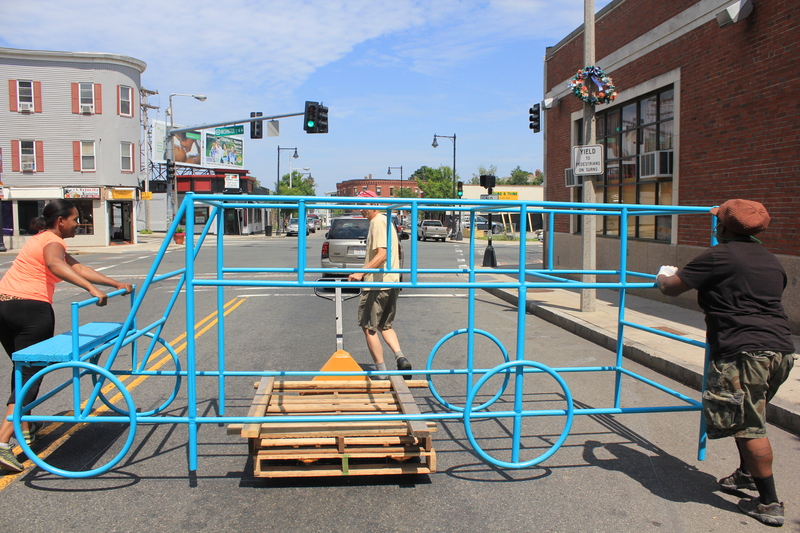 Created from an old playground structure donated by local artists Katherine Bergeron (aka Katrina Galore) and E. Stephen Frederick, the Big Toy frames a space to share creativity, information, and play. Over the eight months that I’ve worked in the Four Corners Neighborhood, I have learned of the community’s specific needs for clear information and self-expression. The Big Four Corners Community Communication Toy is an ideal way to facilitate this dialogue. This is especially important due to the imminent changes brought on by the new Fairmount Rail Station. Displacement, lack of transparency about new development, and ways to become involved in the coming change all require a central, visible location for information distribution and exchange. On the other hand, local artists want a place to display their works and reach more people. 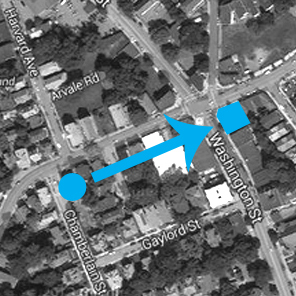 This brightly colored structure would include information that neighbors need. The bright sculptural presence draws attention to The Cornerstone, the new community created gathering space, and serves as its bulletin board. 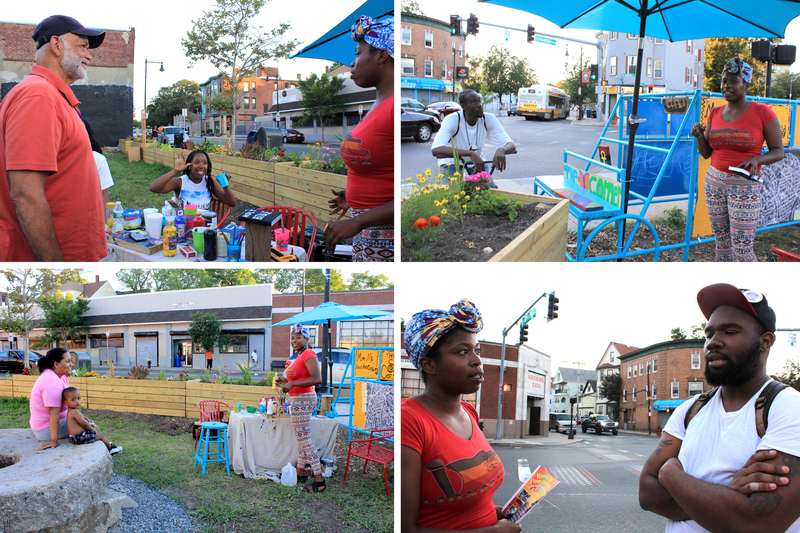 The Big Toy also created a space for the second Public Art Salon, where we engaged community members in creating Story Corner postcards, block-art for MoveMe Gallery, HulaShades, Toy Talks, and spontaneous actions on Friday evenings. At People sat and talked on the millstone and beneath the umbrella on The Big Toy. While the space is certainly open to the public, these informal moments to gather and use the space are invaluable; the creation of The Cornerstone was only the first step in making it a communal gathering space. The formal events we have begun need such spontaneous activity to keep the space in use, and show it off as open to all. During the Productive Fiction event hosted by DS4SI, I met Katherine Bergeron (aka Katrina Galore) and E. Stephen Frederick. They own Torrent Engine 18, a 1869 firehouse from the old Dorchester days. Since 2012, they’ve worked to transform the timeworn structure into both a home and art space. The Saturday that we met, my husband and I went with Katrina and Stephen to see the firehouse: an impressive masonry structure that stirs the imagination. The moist, cold air takes you centuries back in time, while the massive space inside inspires thoughts of what might be. We touched the old bricks and the crumbling mortar where roots pushed through from the outside. We climbed down into the ancient basement, stepped over an interior canal and around tarnished metal equipment long out of use. We then climbed up to roof rafters, as old as the masonry and metal, but somehow more intact. The building feels like a collage of past and future worlds. In the past, the building has been a firehouse, a daycare, and almost became a worship space; during the renovation, it has hosted celebrations, performances, and filming. For Katrina and Stephen, this consuming work is surely taking too long, but it is exciting to witness the process of creation. 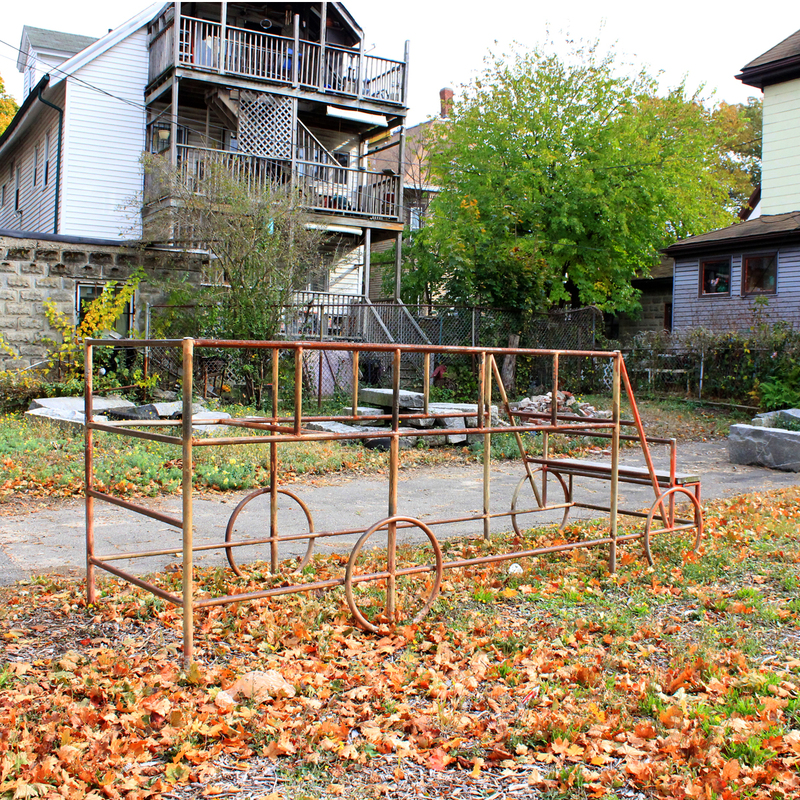 Outside, the spacious back yard also holds remnants from the past: two rusty toy structures from the 1970’s seem ready for play. After some musing about their age, Stephen suggested I may want the piece resembling a school bus. I instantly envisioned it brightly painted as a big Community Toy. The metal frame is ideal for multiple interactive panels where neighbors can share information, express themselves, and have conversations.